What is a quality afternoon for my 4 year old? Read a book, have a cookie baking and decorating session, then snuggle and read some more. 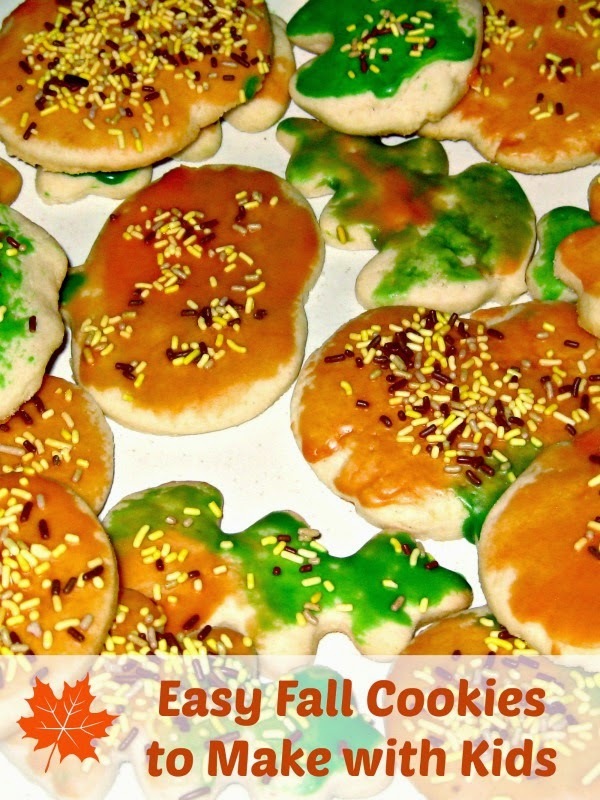 This easy fall cookie recipe is perfect for fall afternoon at home. This post has been updated on September 16, 2014 with new graphics and links. Disclosure:I am an Amazon associate and this post contains affiliate links. For full disclosure, please click here and thank you for supporting my blog! My daughter is a big fan of audio versions of Little House in the Big Woods and Little House on the Prairie. While the original books might be a bit much for an average attention span of a 4 year old, I also highly recommend My First Little House picture books beautifully illustrated and adapted from original books. Smarty especially enjoyed A Little House Birthday since her own birthday is coming up in two weeks. She often incorporates story lines from these books into her pretend play. There are hunting games, gathering games and “going to Kansas in the wagon” games. For some reason Smarty's wagon usually stops in Canada for a picnic – I guess Canada sounds very much like Kansas to her. She also plays building a house, but she insists that she is going to buy the wood for the house in the store, because the logs from the forest will have dirt on them and I don’t want to get splinters. And, of course, there are innumerable cooking games – something that my daughter really loves. She kept asking for a baking day like in a Little House for a while and I decided to fulfill her wish when the cloudy fall weather blew in. Tip #1: Prepare your dough in advance. Young children don’t like waiting, so I prepared simple Betty Crocker sugar cookie recipe in advance during a lunch break on my day of working from home. The recipe was all ready to go by the time I picked her up from her preschool. Tip #2: Don’t hope that your children will do things your way. As a math major, I always try to fit as many cookies on a rolled sheet of dough as possible. Smarty doesn’t (yet) think that way, so I gave up on directing her and just let her discover her own way to fit cookies on the sheet. Tip #3: Give your children manageable jobs. I did all the measuring and all the mixing for the sugar icing recipe following directions from All Recipes. Smarty was in charge of mixing in food coloring - can you see how hard she concentrates on keeping her icing in the saucer? Tip #4. Involve your children in cleaning up. Smarty usually conveniently disappears when it comes to clean up time, but this time I kept her busy with clean up while cookies baked. She was very anxious to earn her decorating rights. Tip #5. Don’t expect your cookies to win cookie decorating awards. I let my almost 4 year old go wild with sprinkles and icing. She did as many as she wanted and was very proud of her cookie decorating skills. Yes, she was messy and sticky, but so very happy! Tip #6. Don’t wait until dinner. Life is short, so eat dessert first… with a glass of milk. By the way, Smarty only enjoyed the very first cookie, then she firmly declared that all future cookies need to have something chocolaty in them. More Fun With Kids in The Kitchen? Follow Natalie Planet Smarty Pants's board Kids in the Kitchen on Pinterest. I'm assuming they hosed them down? I was going to say what yummy looking pizza until you mentioned glazed cookies! My eyes must be playing tricks on me. We tried Little House audio books and JC did not take to them. I have a set of Little House books so maybe the readings will go better. Personally, I didn't like thw voices in the audiobooks. Maybe if the actors/actresses i grew up with did them, it would have been more appealing. Hello! Thanks for your comment! We are actually reading the Magic School Bus books right now. I'm not too "keen" on the Magic Tree House books. Squeak really loves MSB though!! This blog hop is fun!LOL! I tried one of the little house books but R wasn't really interested. I'm hoping she comes around! They filled a big homemade tub and one by one everyone bathed in it with homemade soap. My grandma with 11 kids lined them up by age and sponge bathed them every night. Your cookies look very yummy. That is cute that they all stop in Canada. Clean up is probably why baking was once a week in those times. Well, that and how long it took to get everything done. Laura always makes her mother sound like a very tidy house keeper, so I imagine clean-up was quite fastidious. I should try the Little House audiobooks with Emma. Did you know there is a Little House cookbook? I remember seeing it somewhere, maybe at my parents house for one of my younger siblings. I signed out that cookbook when I was a child MaryAnne! Bear is loving the audio books from the library. We are on the third one. We are also reading the actual books at night before bed. Bear also includes stuff from the books in her pretend play. She loves them so much I am considering purchasing the audio books. I actually like the voices. The pumpkin cookies look really yummy! Some great tips and yummy looking cookies! Thank you for sharing at Sharing Saturday!